Yes, a salad can be refreshing, especially in the Phoenix heat. When temperatures start to rise outside I lose all desire to eat; much less cook. So I try to focus on preparing more fresh, light and cold meals. I find this is also a great way for me to incorporate more fruits and veggies into my life. 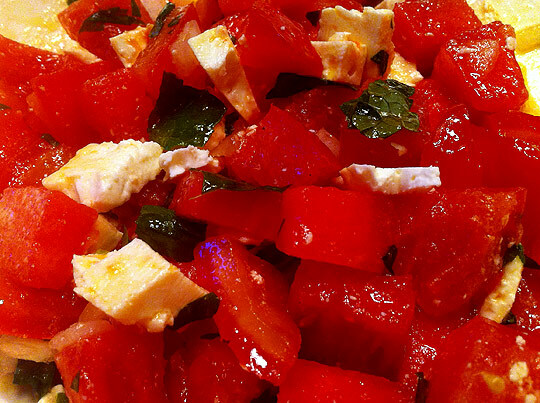 During a recent visit to the Farmer's Market I picked up the juiciest watermelon and some really ripe tomatoes and decided to make a watermelon salad. This healthy and refreshing mixture makes for a perfect meal on hot summer nights. I am including this in the Tomato Love Recipe Exchange being hosted by Gimme Some Oven and Bake Your Day and sponsored by Big Kitchen. Also visit Recipe for Change to learn more about how to support tomato farmers. Mix everything together in a bowl and toss to coat. Refrigerate for at least 30 minutes to get all ingredients cold. This sounds sooo refreshing! Thanks for participating in the recipe exchange!